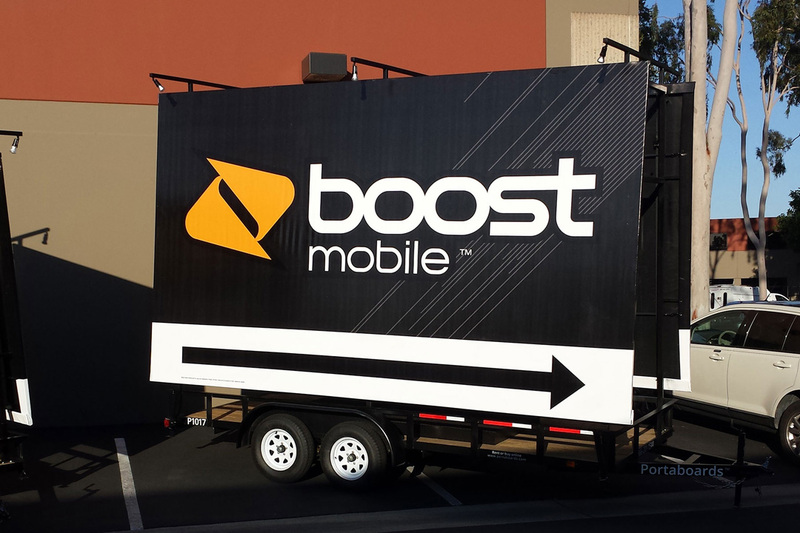 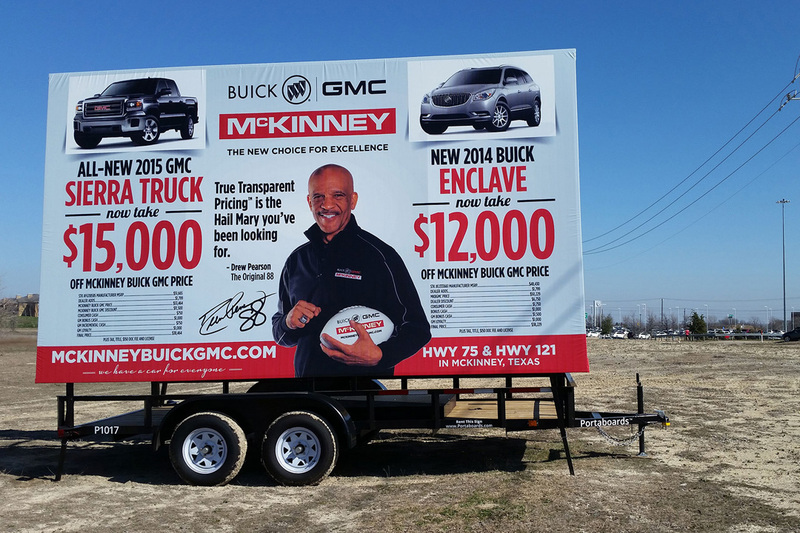 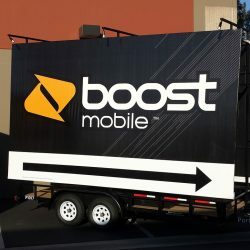 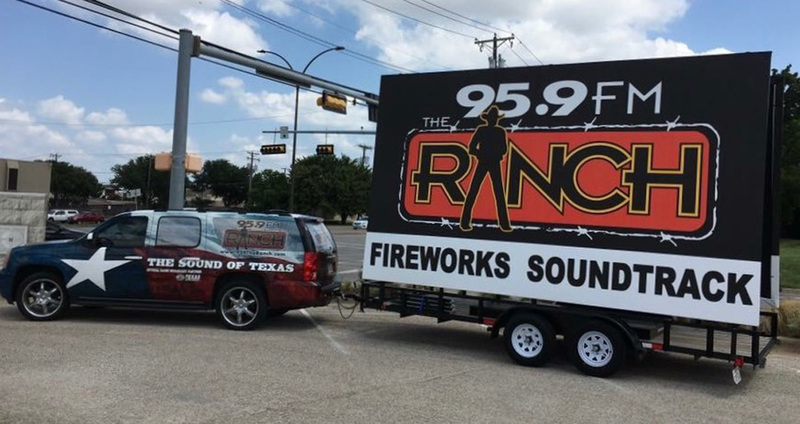 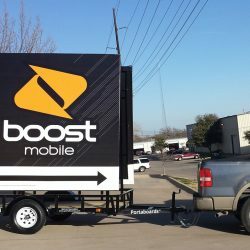 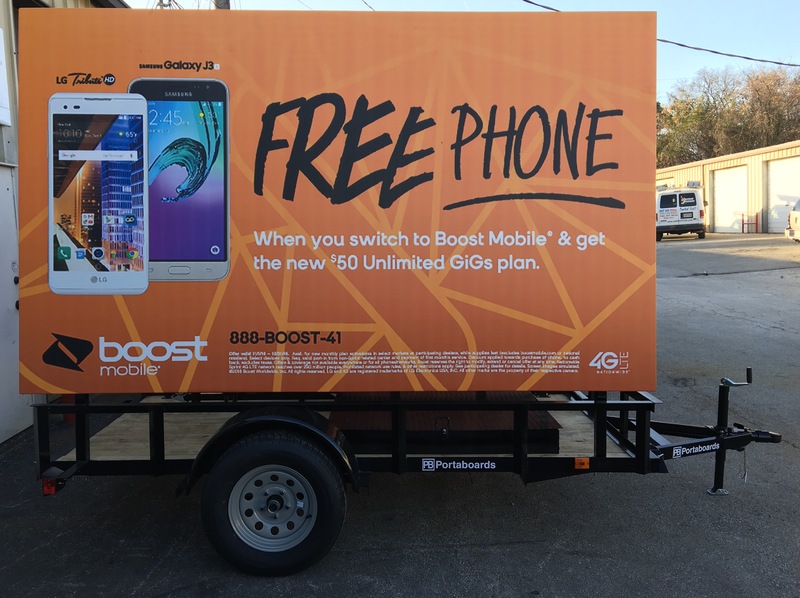 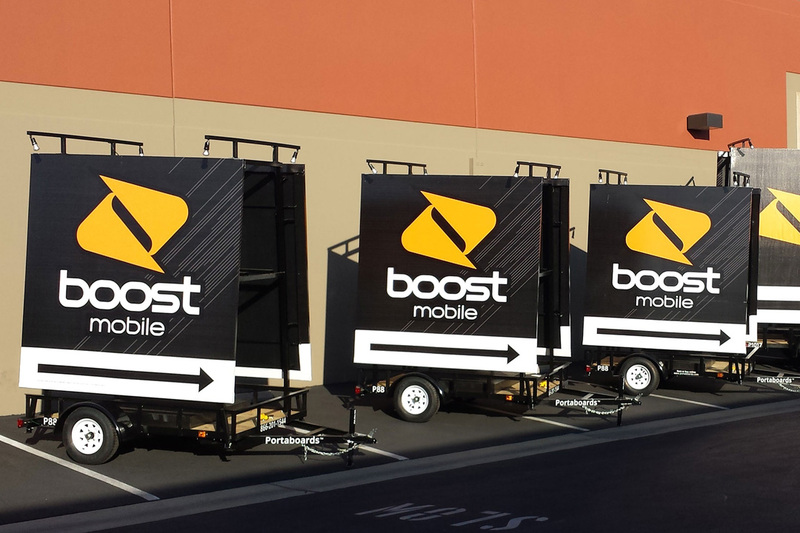 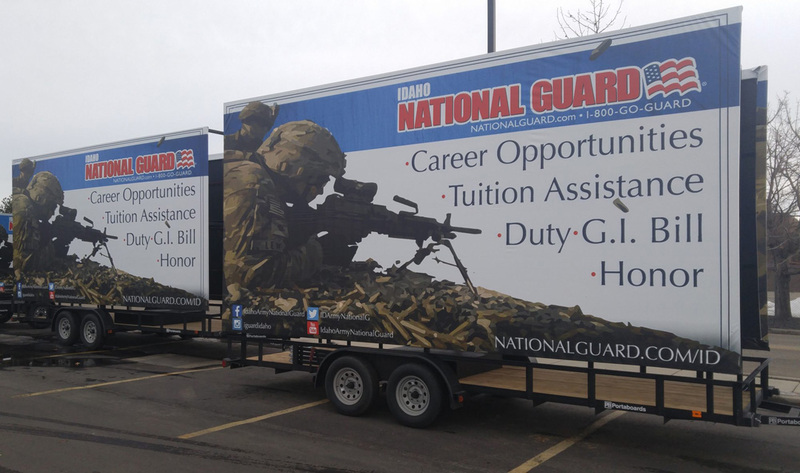 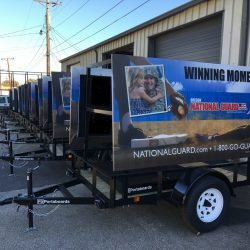 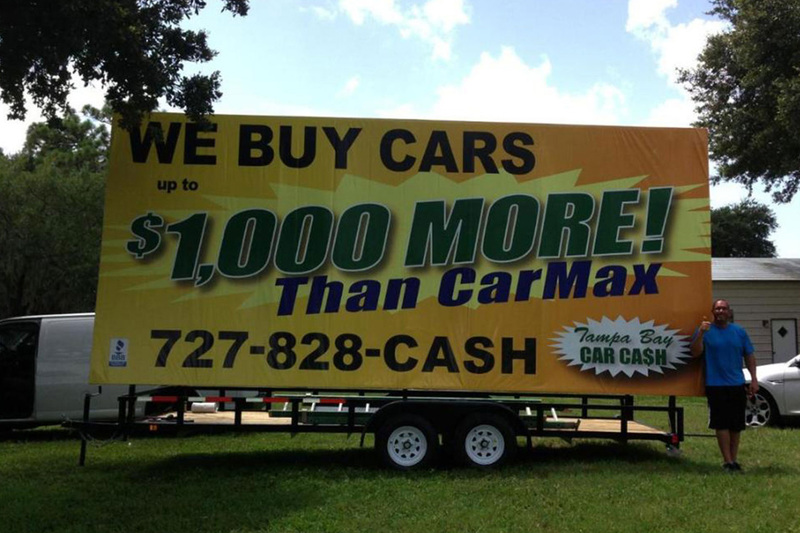 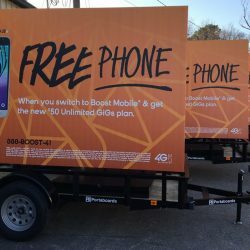 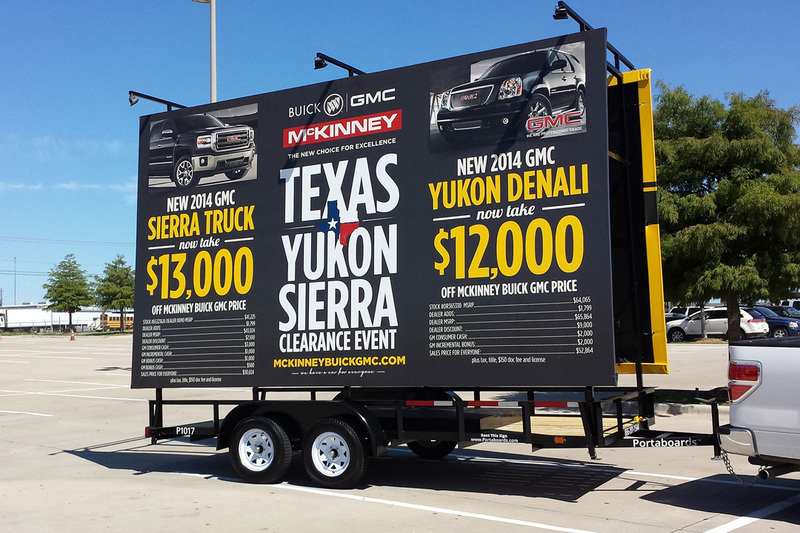 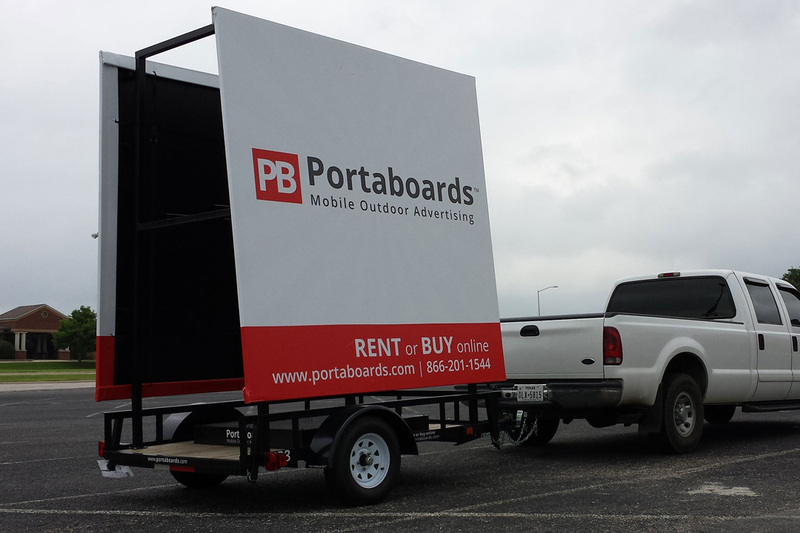 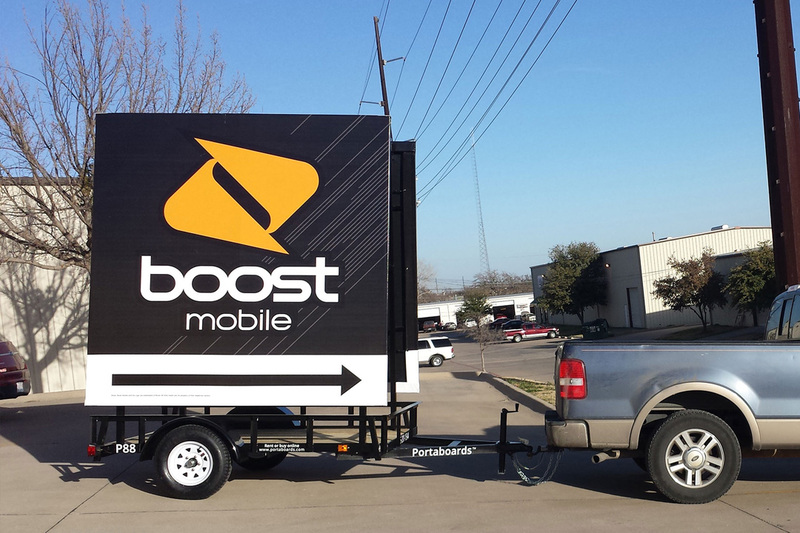 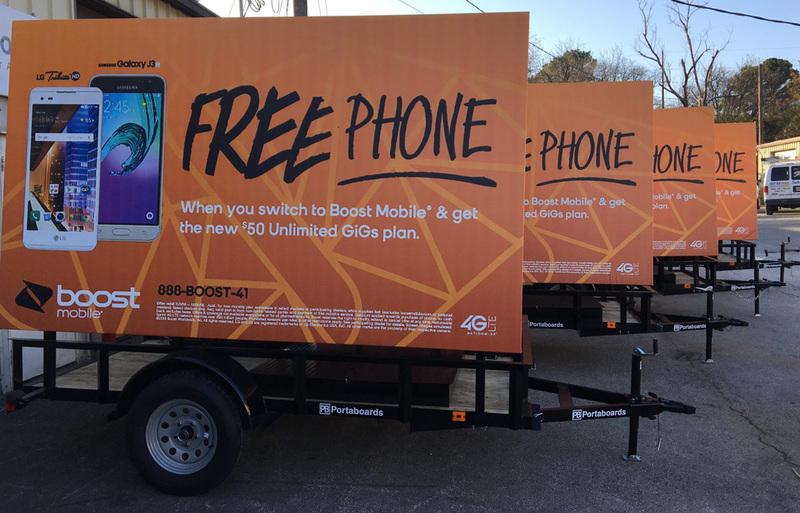 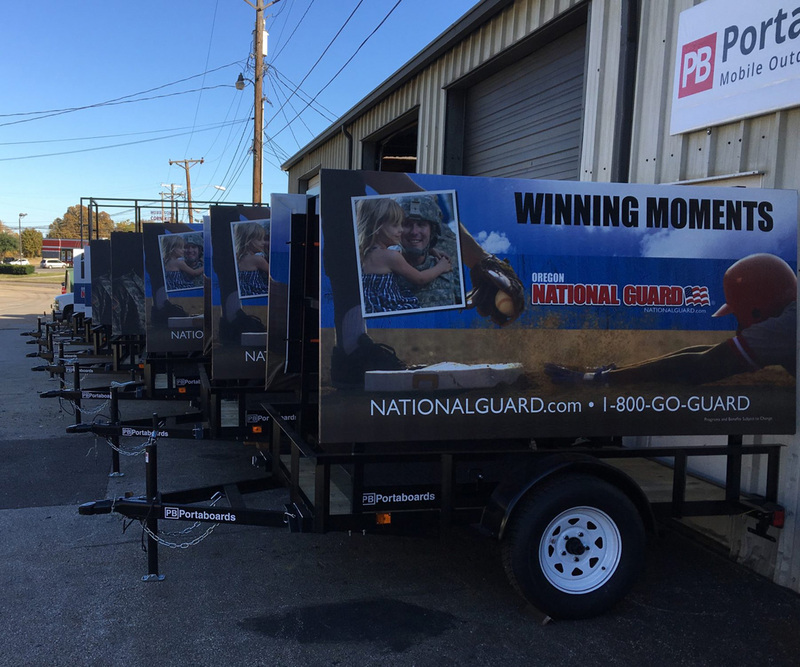 Our original mobile billboard model has great success in rental campaigns and events. 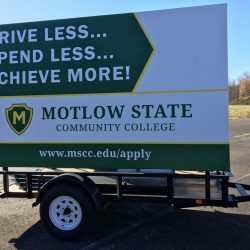 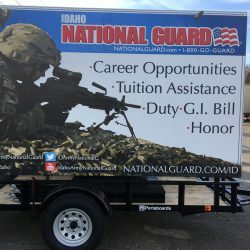 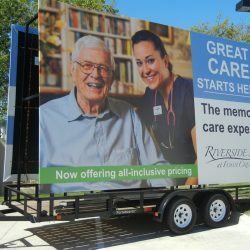 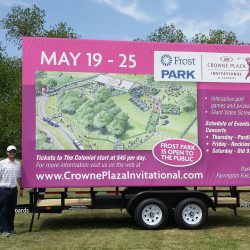 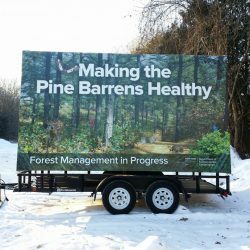 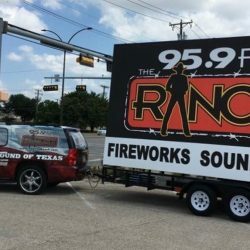 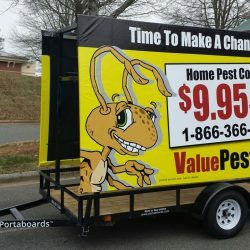 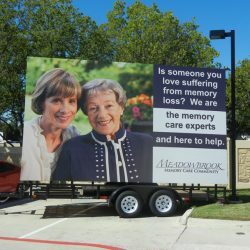 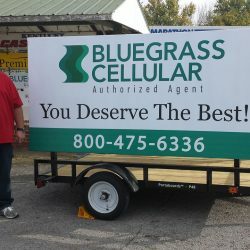 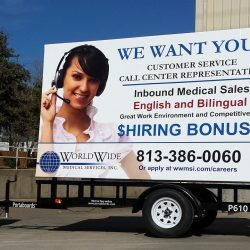 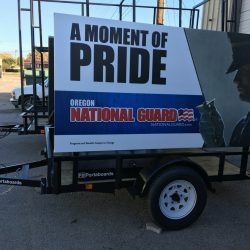 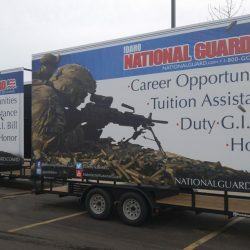 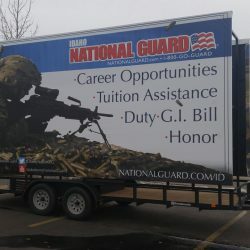 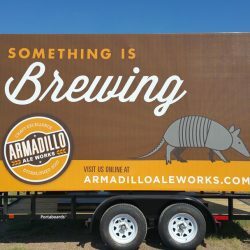 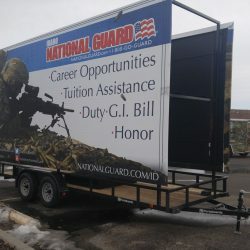 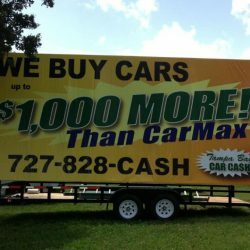 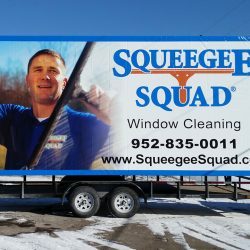 The two-sided portable billboard saves time and money with easy and fast vinyl sign installation. 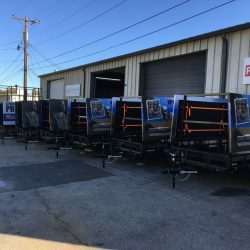 Each unit is supplied with a weight box, as well. 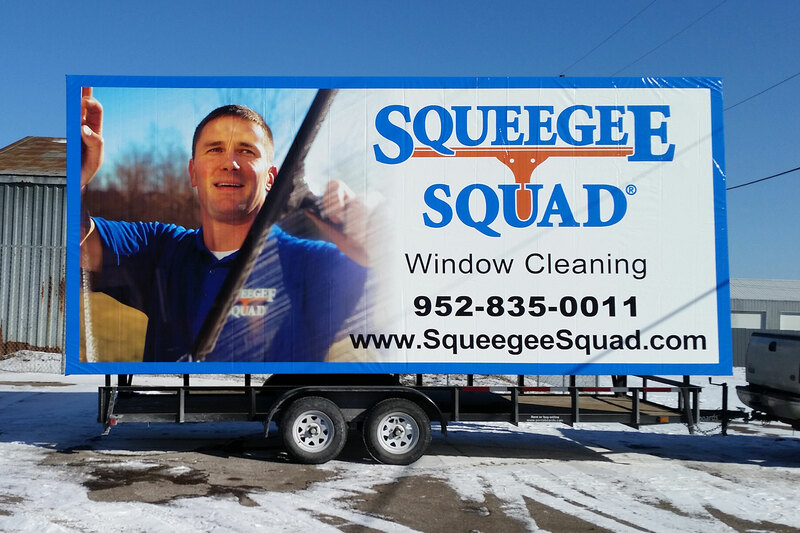 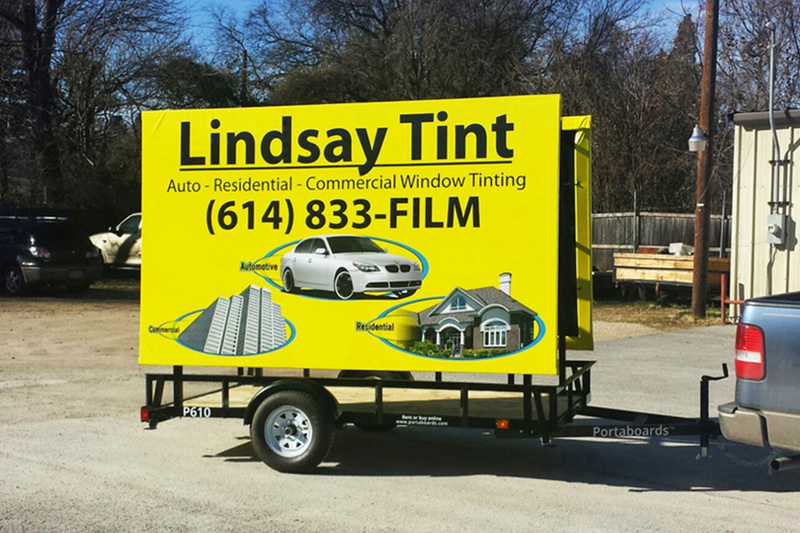 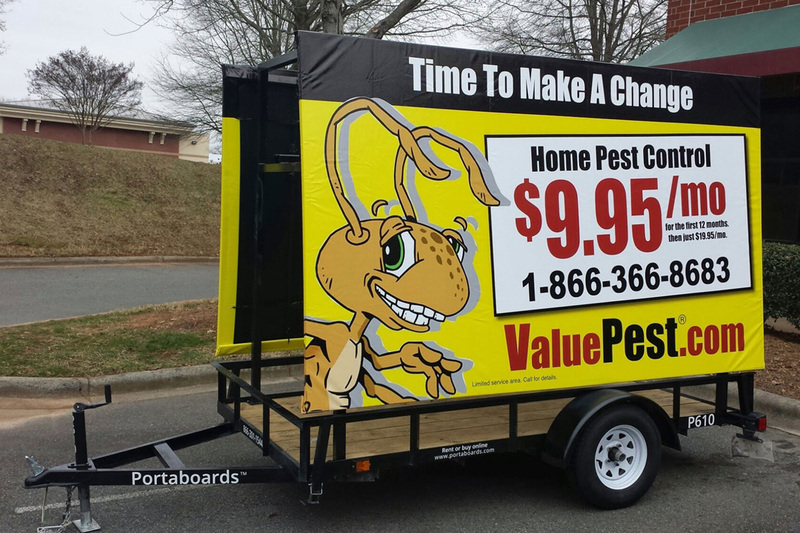 This is a stylish and classic mobile billboard style that will help your business stand out! 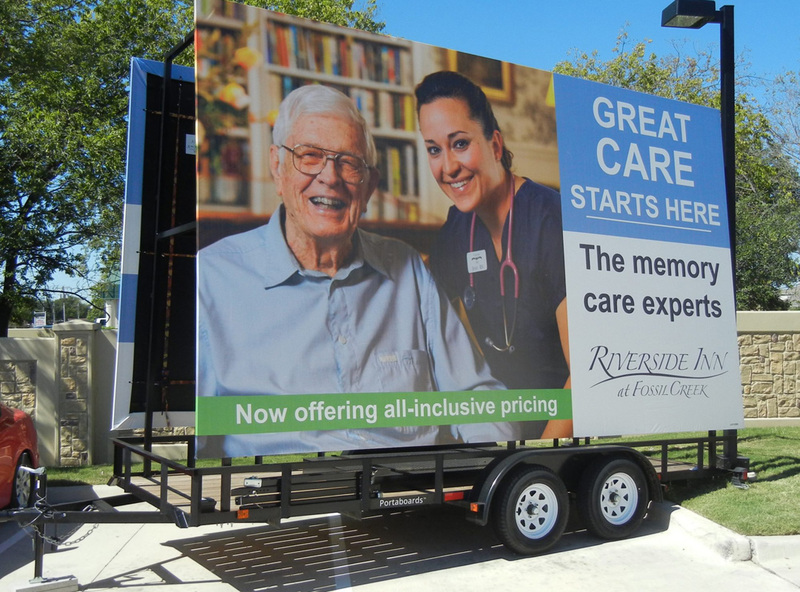 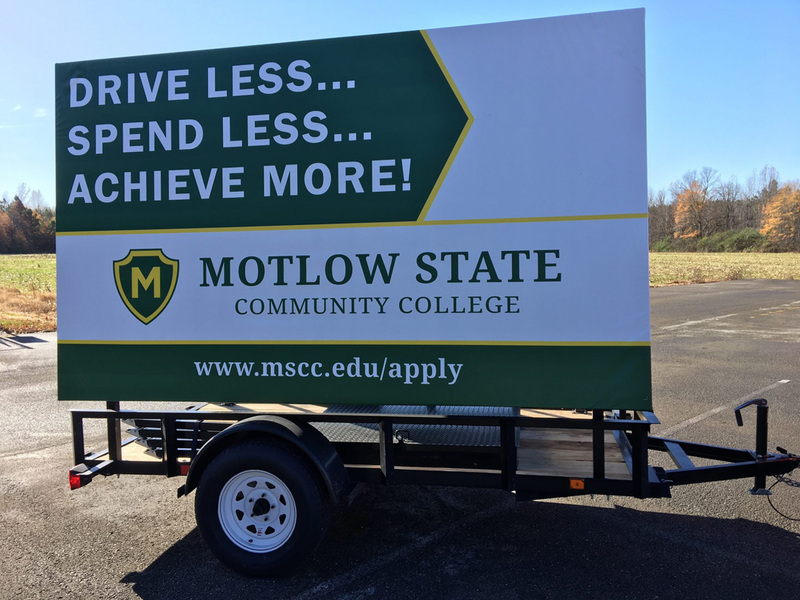 If you want to keep your advertising simple but upscale, this two-sided mobile billboard is a great choice. 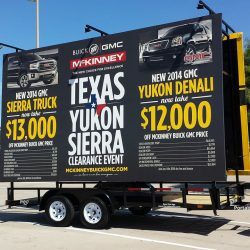 All two-sided billboards can be upgraded with an external solar package lighting system. 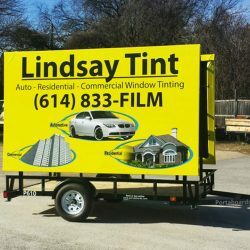 Ensure your sign’s visibility even at night! 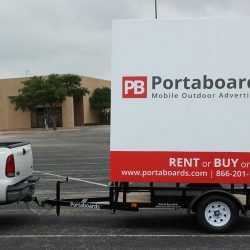 64 sq-ft of advertising space on the double sided 4’x8′ mobile billboard trailer. 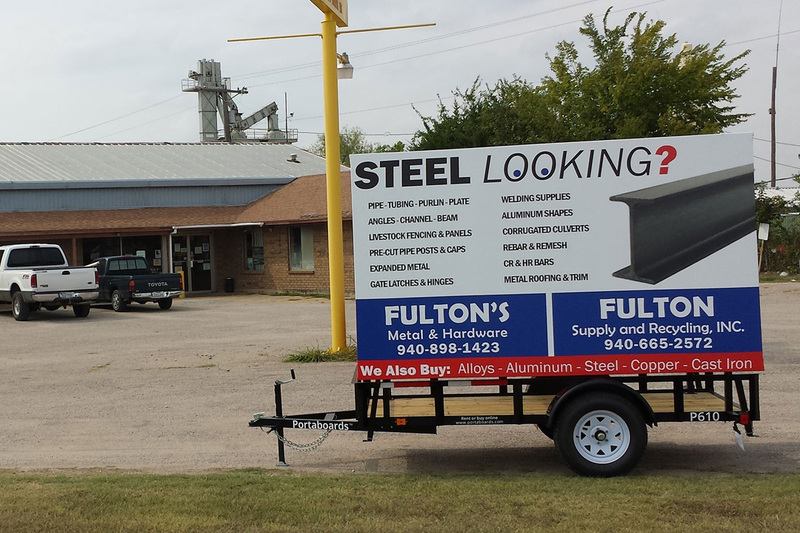 Comes with full 5’x8′ utility trailer and more. 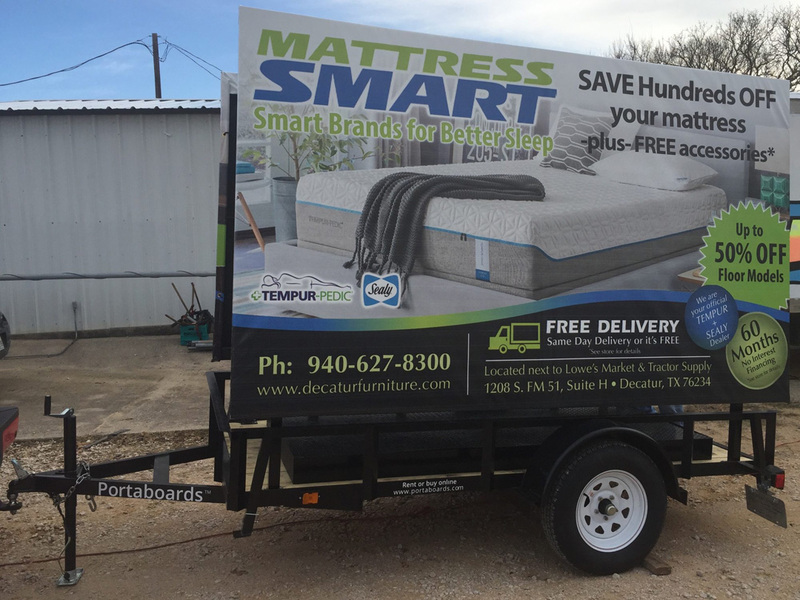 This is a great way to advertise for your business! 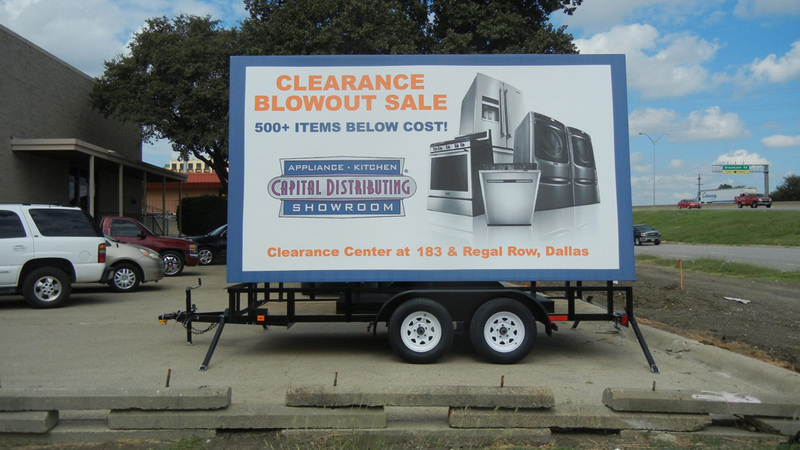 120 sq-ft of advertising space on the double sided 6’x10′ mobile billboard trailer. 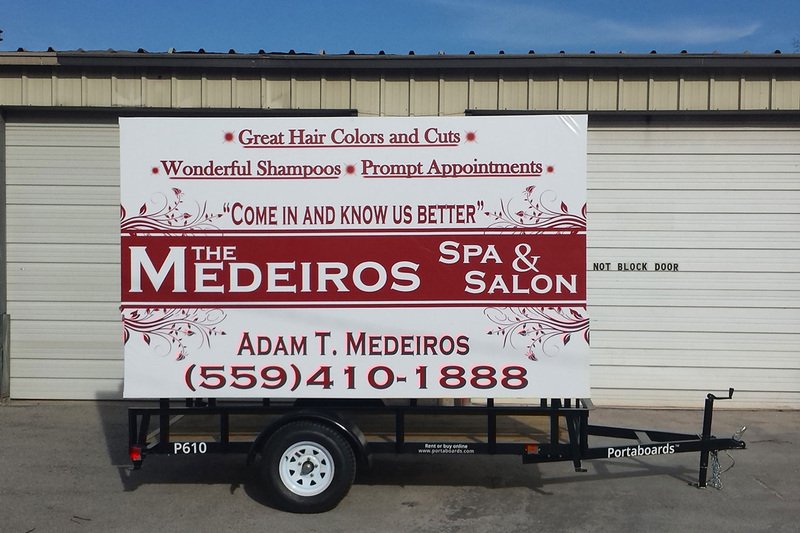 Comes with full 5’x10′ utility trailer and more. 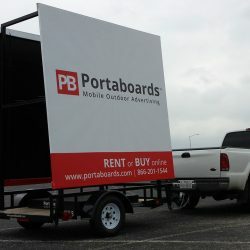 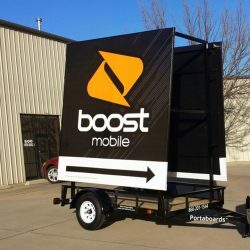 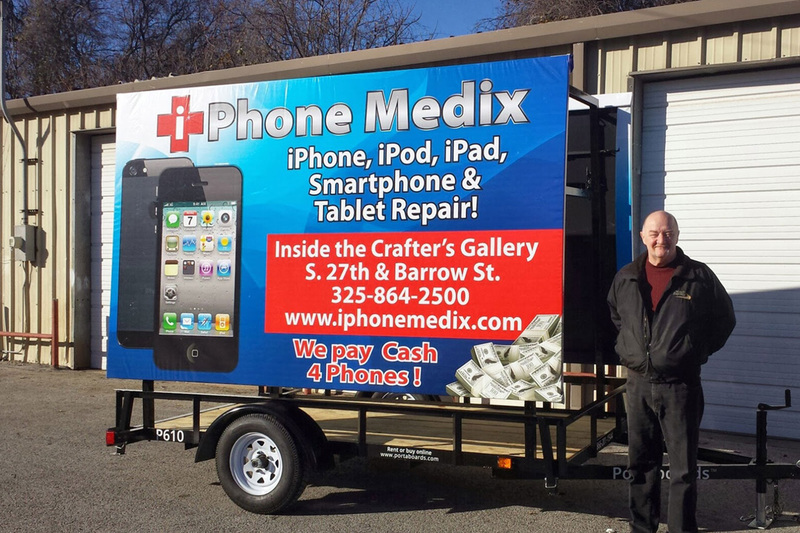 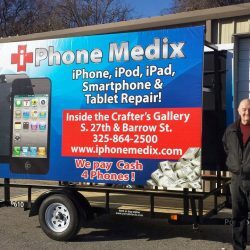 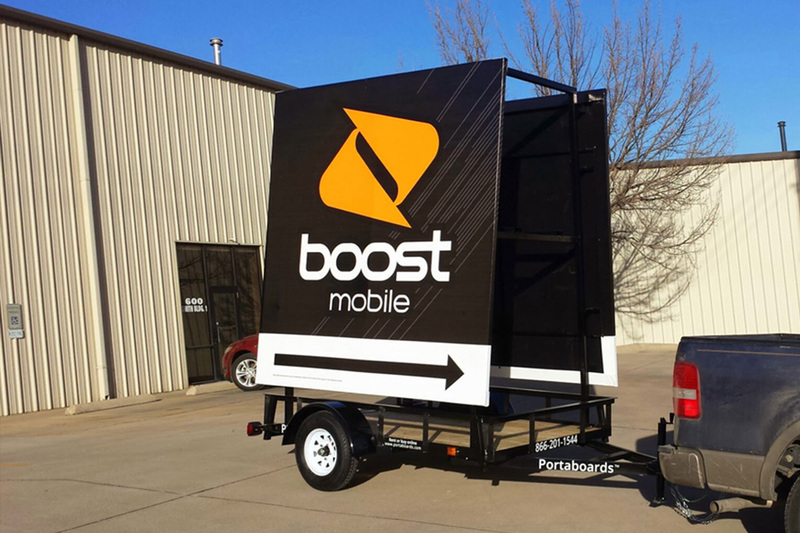 This mobile billboard gives you the space you need to properly advertise your business. 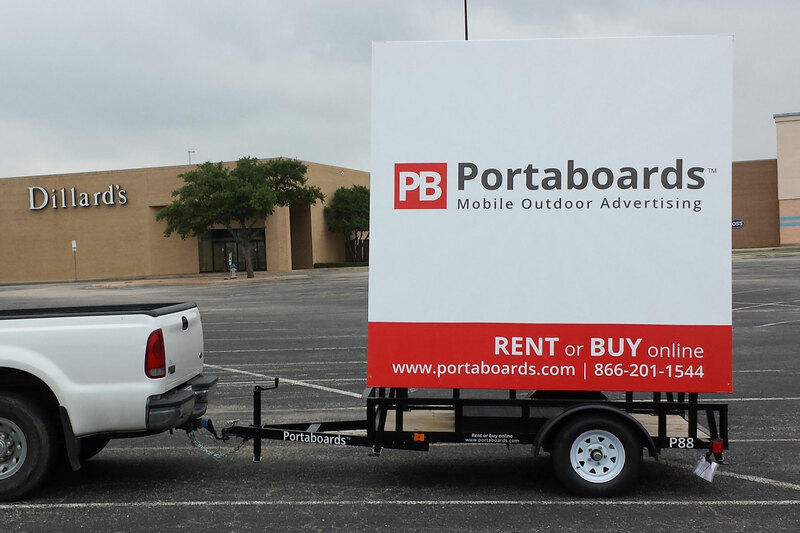 128 sq-ft of advertising space on the double sided 8’x8′ mobile billboard trailer. 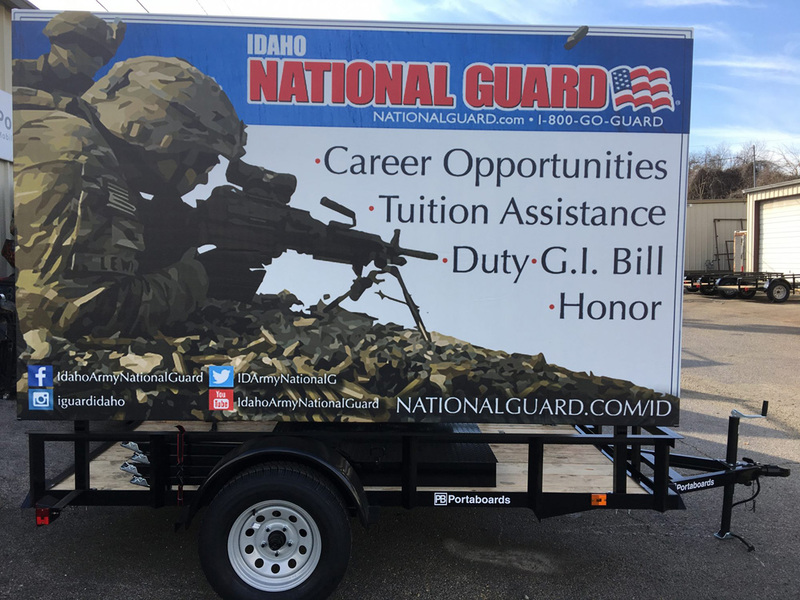 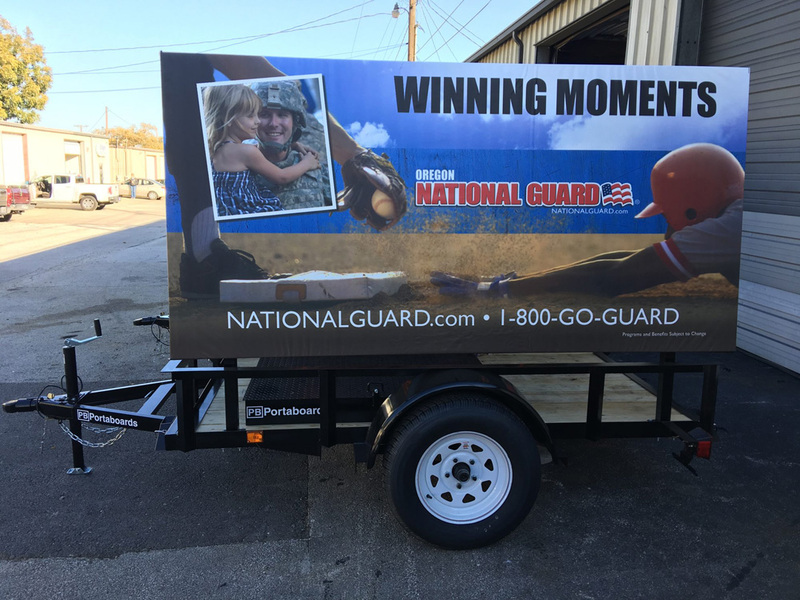 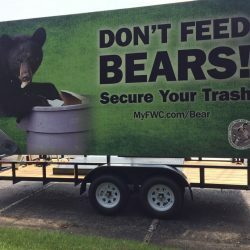 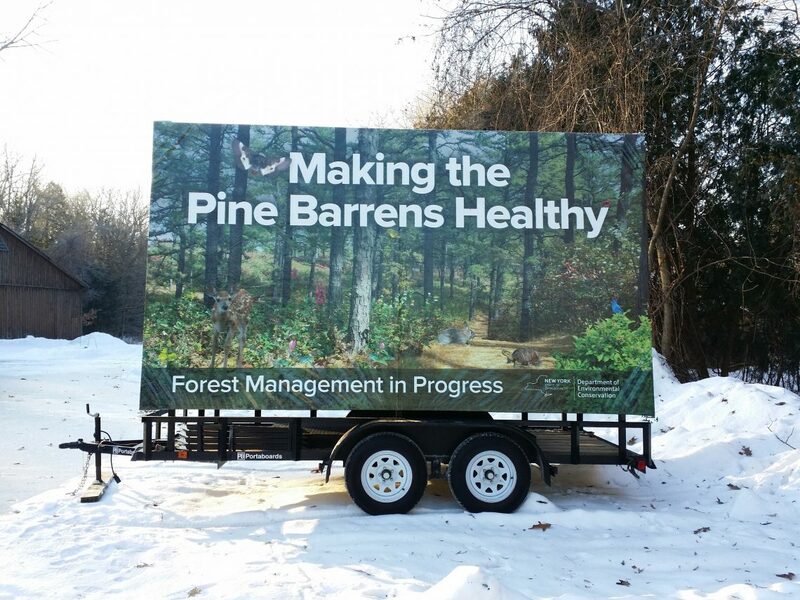 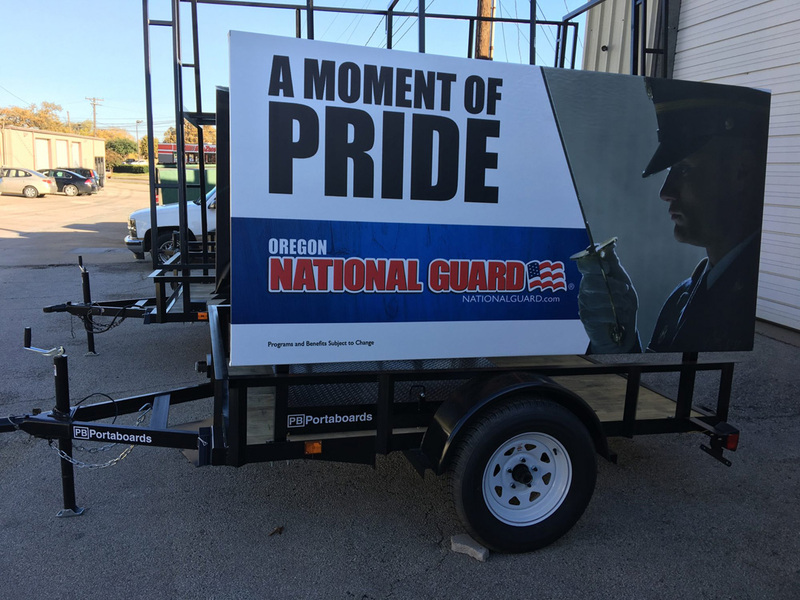 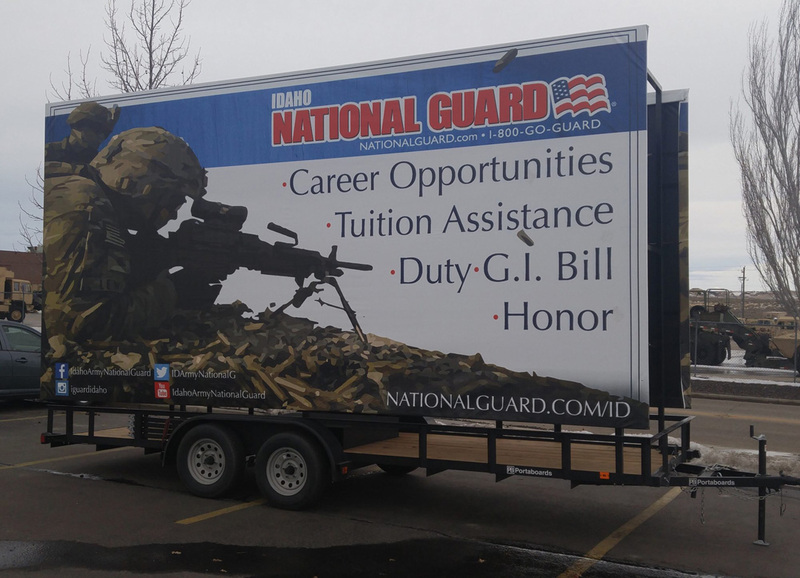 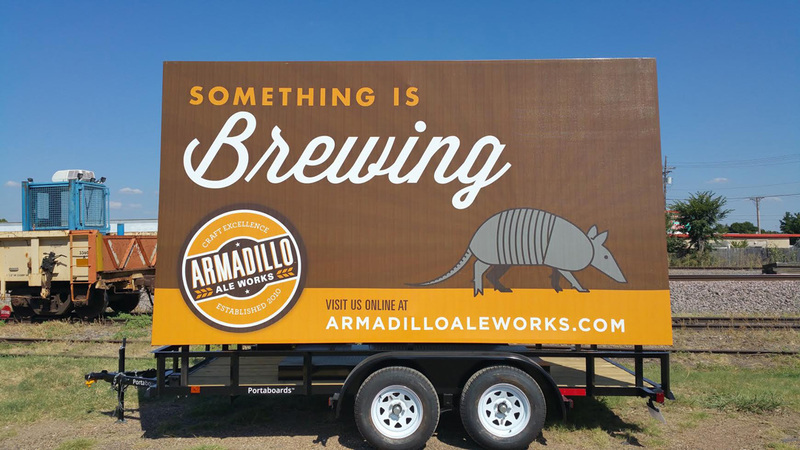 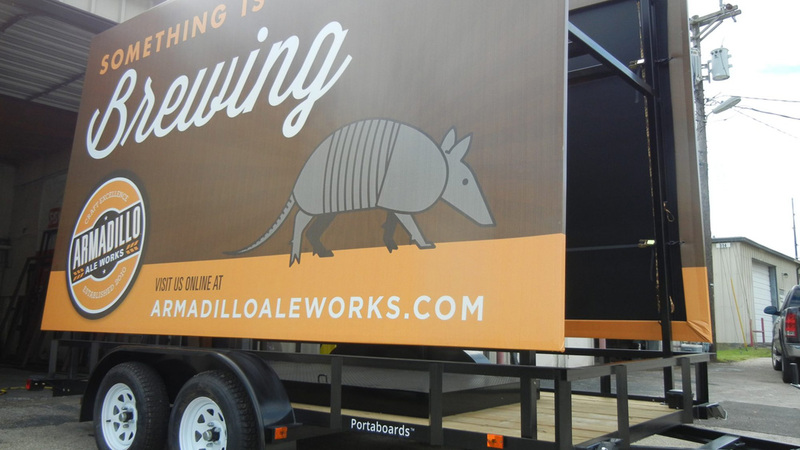 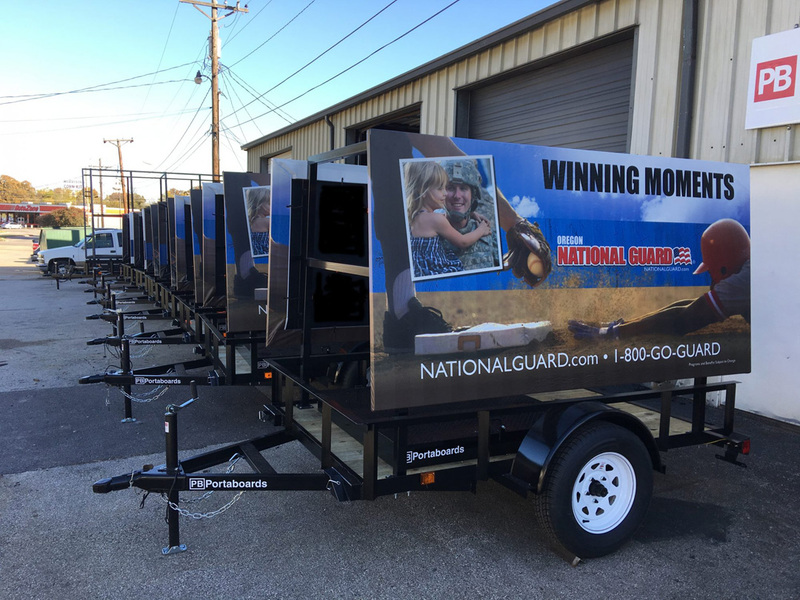 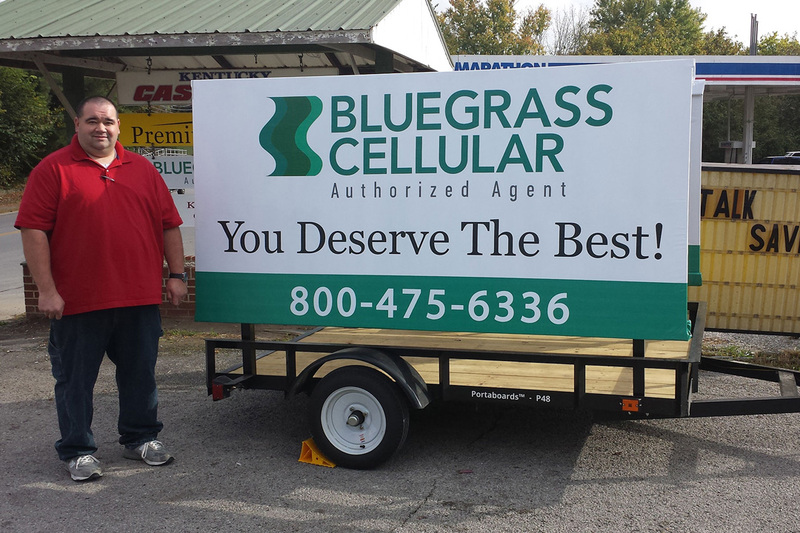 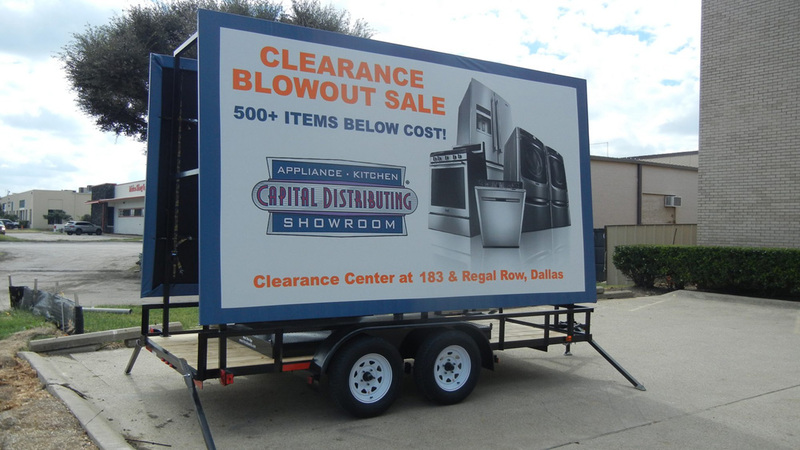 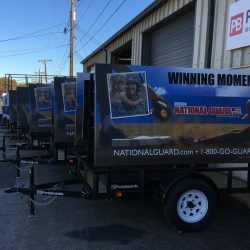 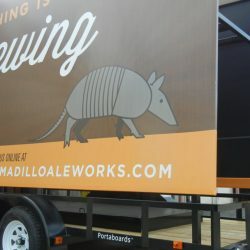 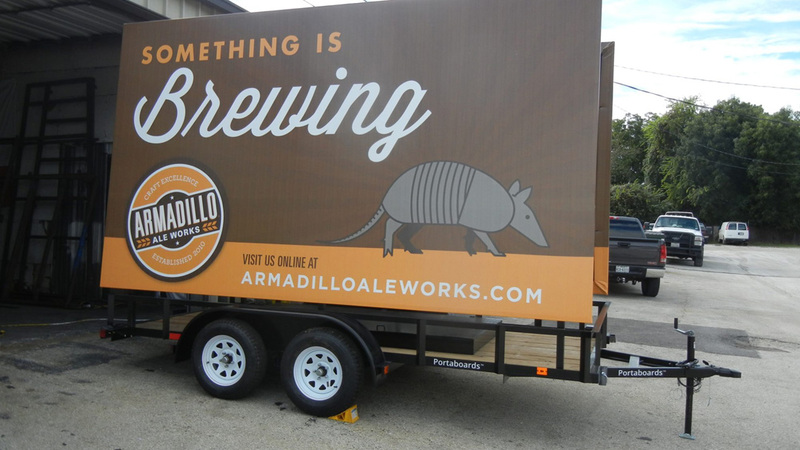 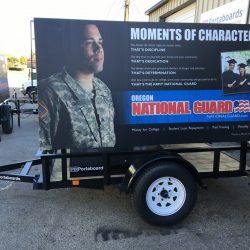 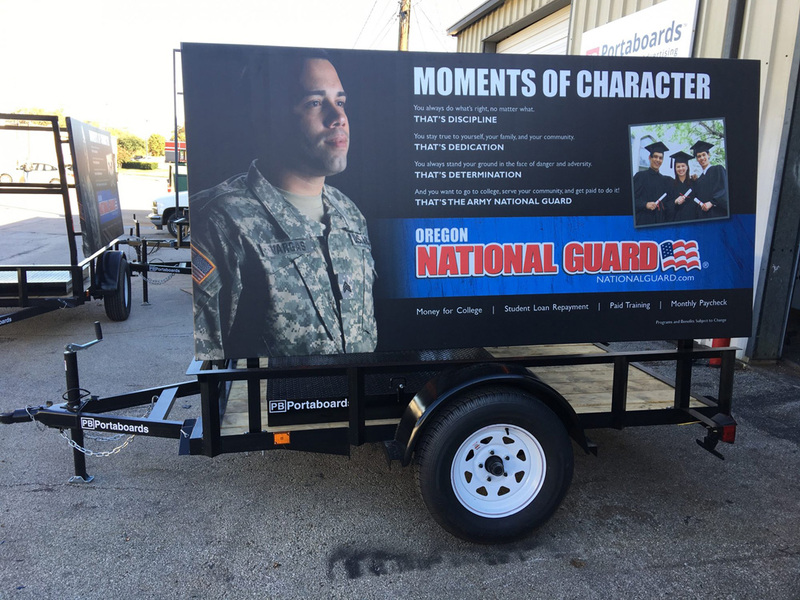 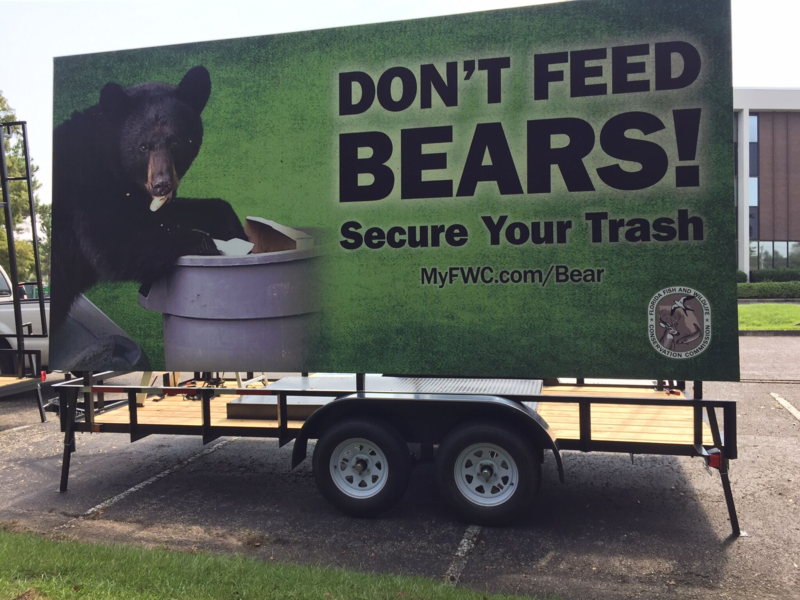 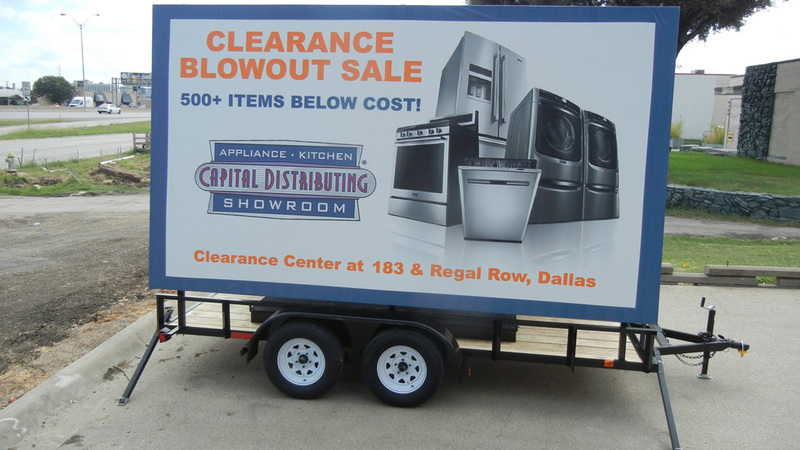 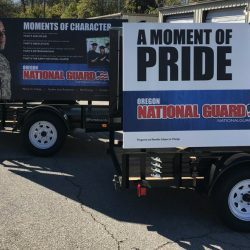 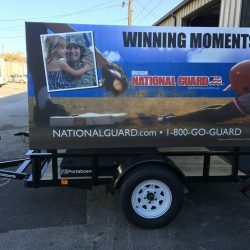 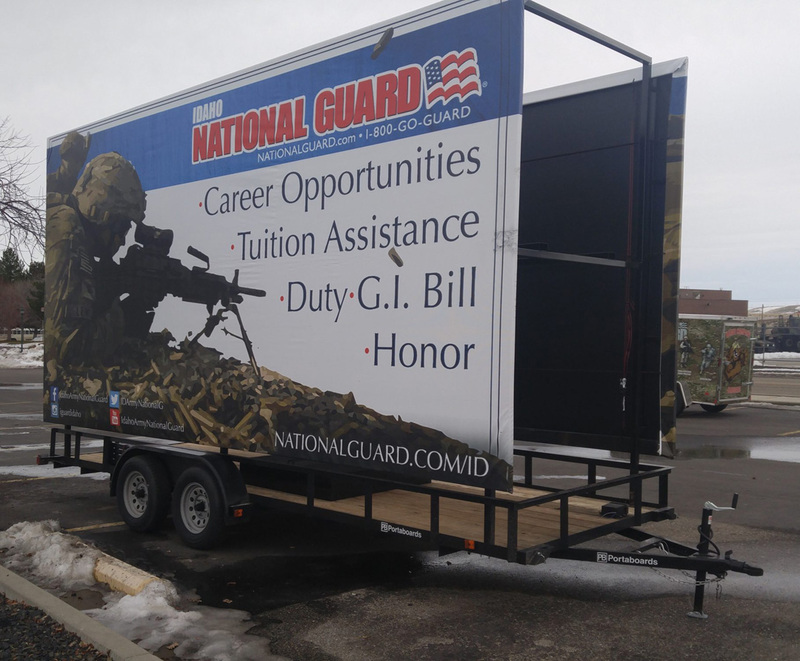 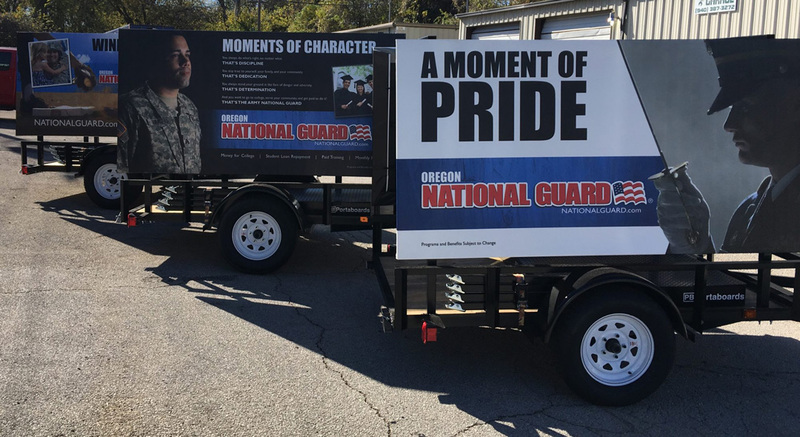 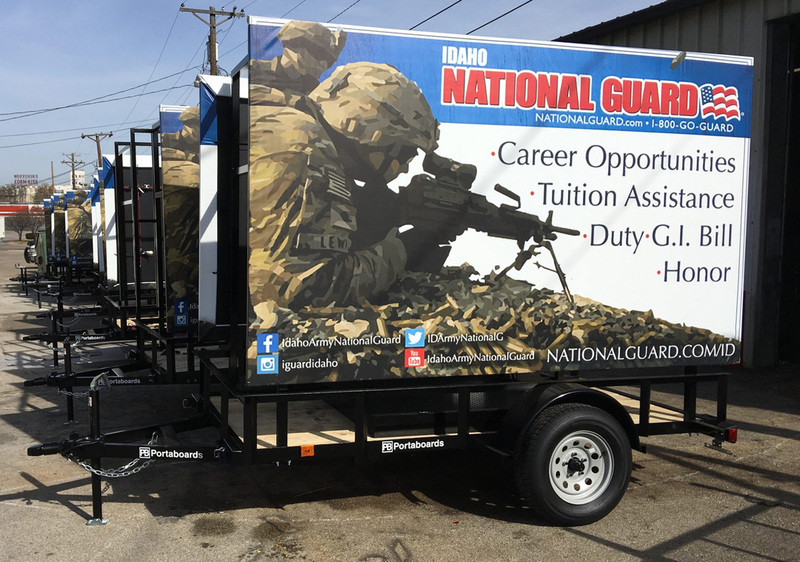 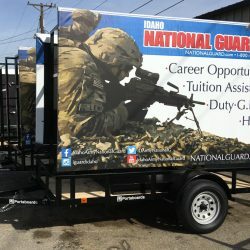 This billboard product comes with full 5’x8′ utility trailer and more. 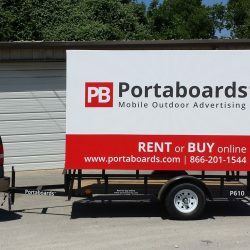 Advertise your business in style with this two-sided billboard! 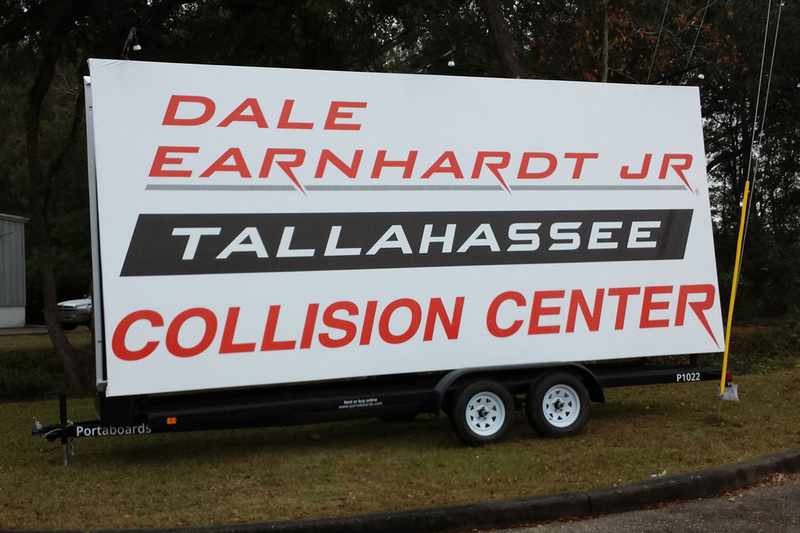 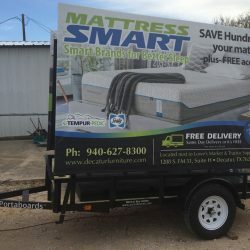 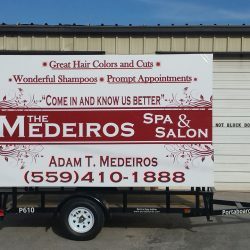 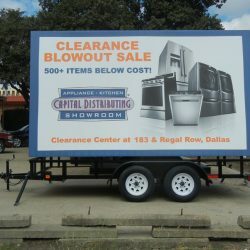 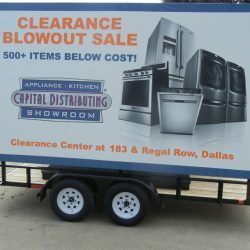 Best Seller – 224 sq-ft of advertising space on the double sided 8’x14′ mobile billboard trailer. 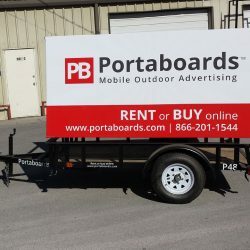 Comes with full 6.5’x 14′ ft trailer and more. 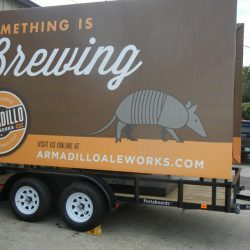 Now with double axles and electric brakes, as well as a breakaway kit. 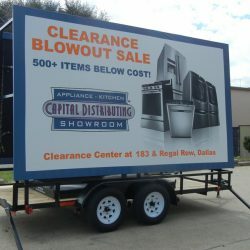 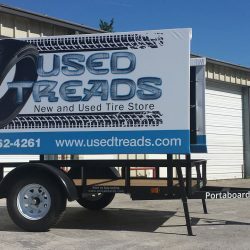 Best Seller – 340 sq-ft of advertising space on the double sided 10’x17′ mobile billboard trailer. 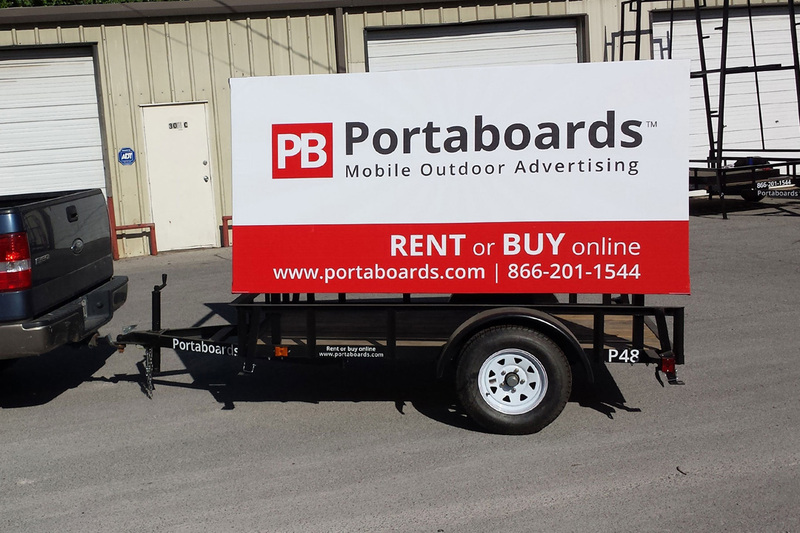 Comes with full 6.5’x16′ utility trailer and more. 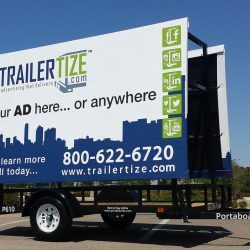 This billboard comes with double axles and electric brakes, as well as a breakaway kit. 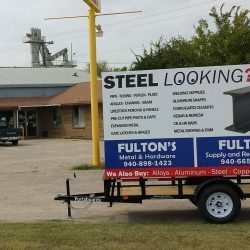 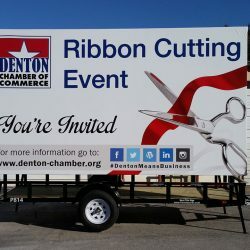 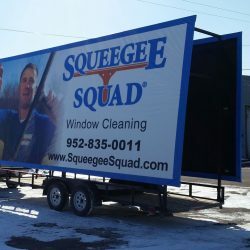 Get your business noticed with this billboard! 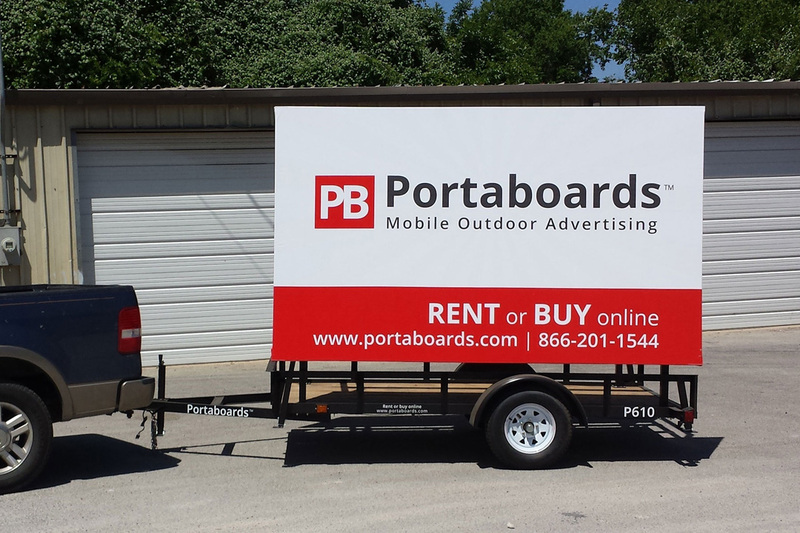 400 sq-ft of advertising space on the double sided 10’x20′ mobile billboard trailer. Comes with full 6.5’x20′ utility trailer and more. 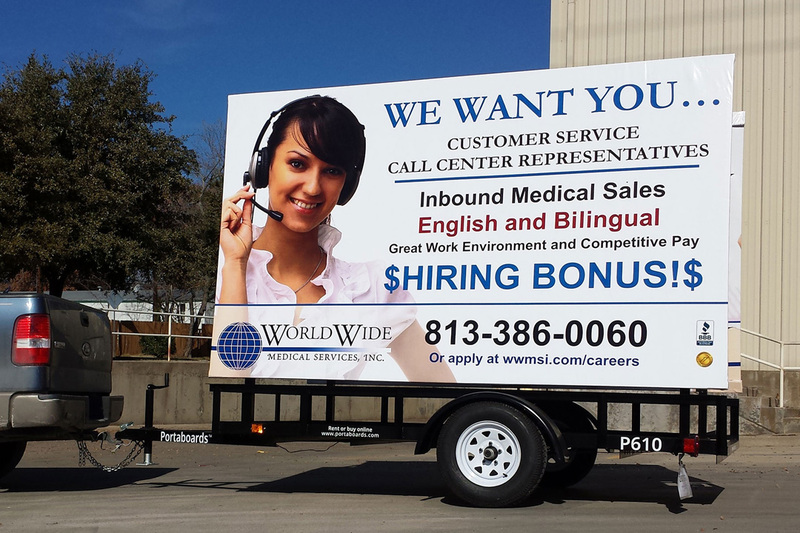 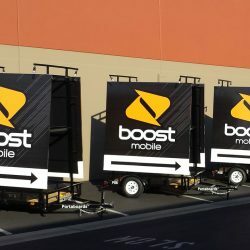 This mobile billboard also comes with double axles and electric brakes, as well as a breakaway kit. 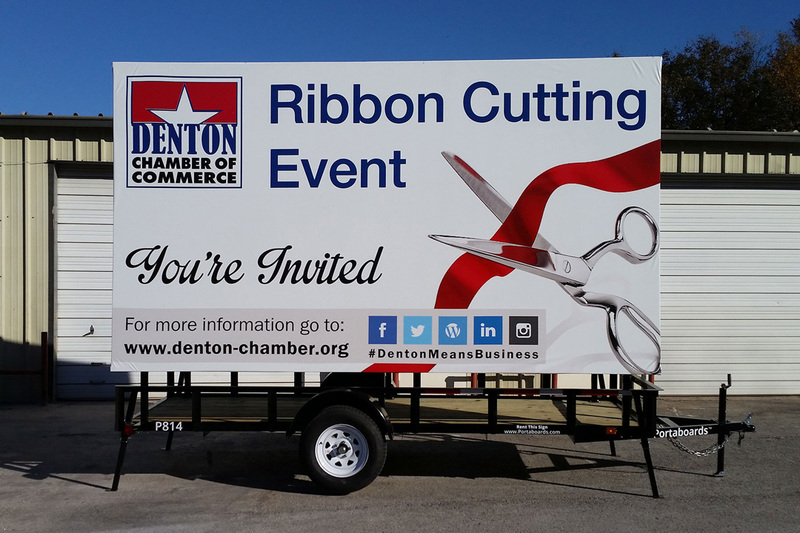 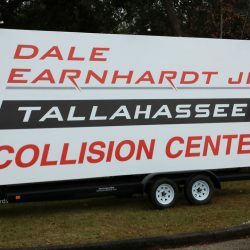 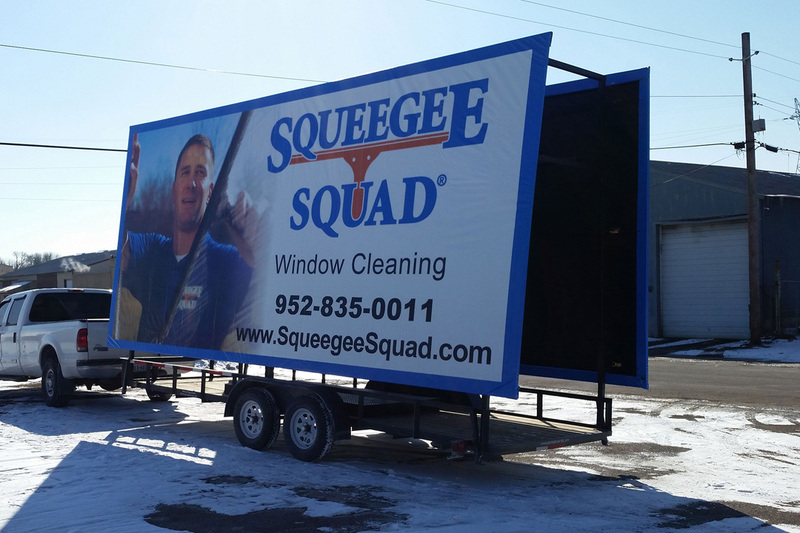 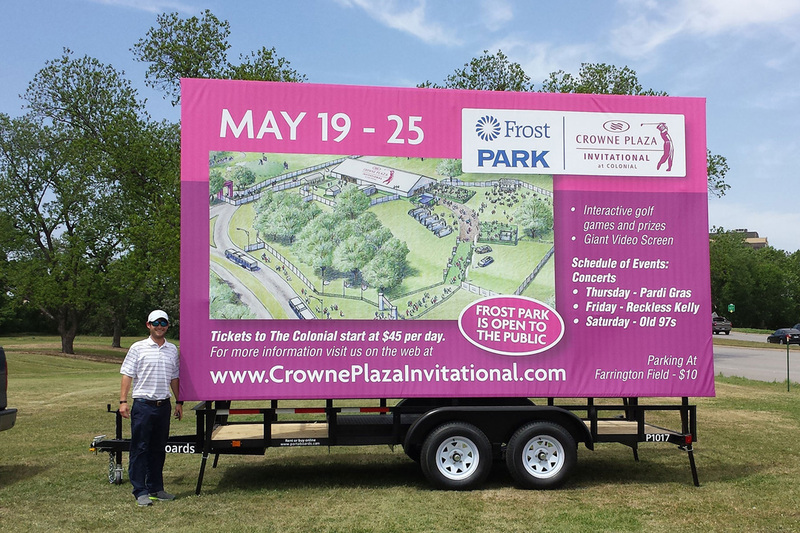 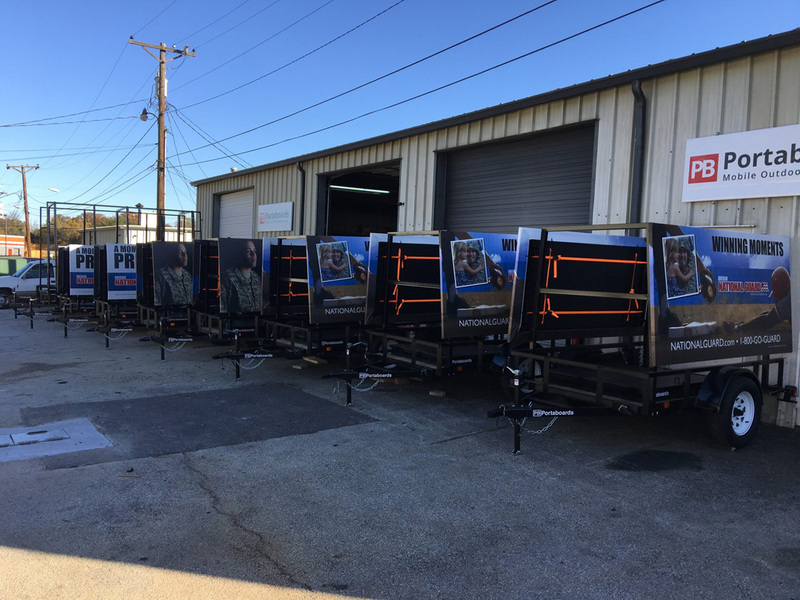 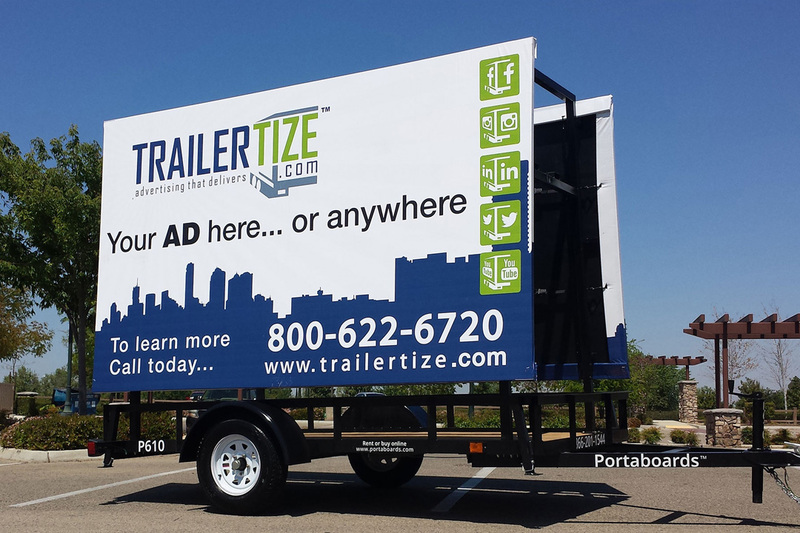 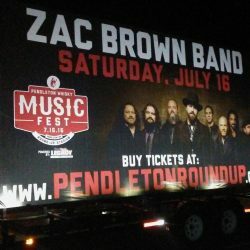 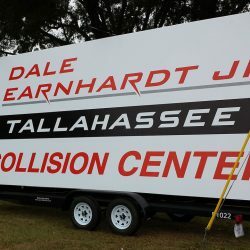 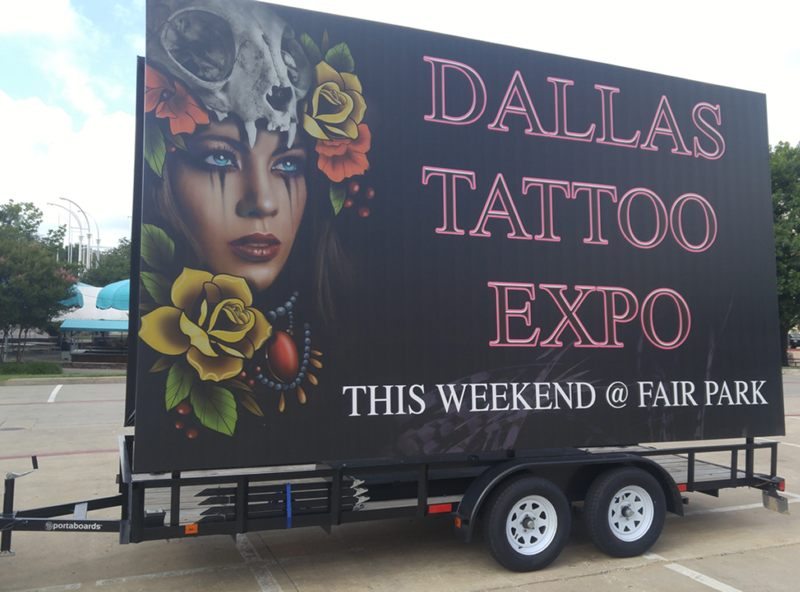 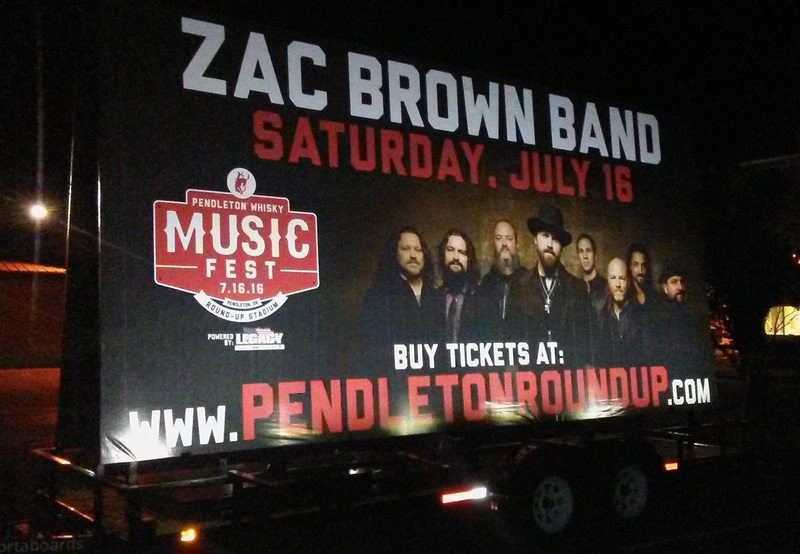 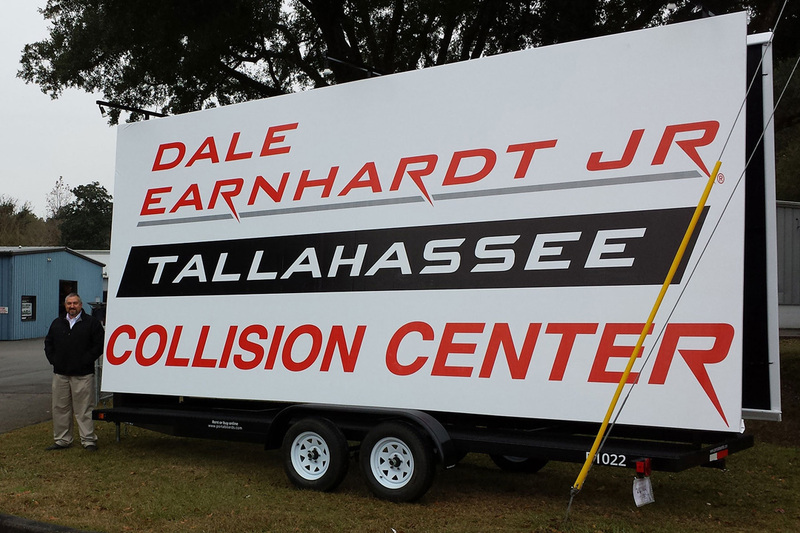 Largest – 440 sq-ft of advertising space on the double-sided 10’x22′ mobile billboard trailer. 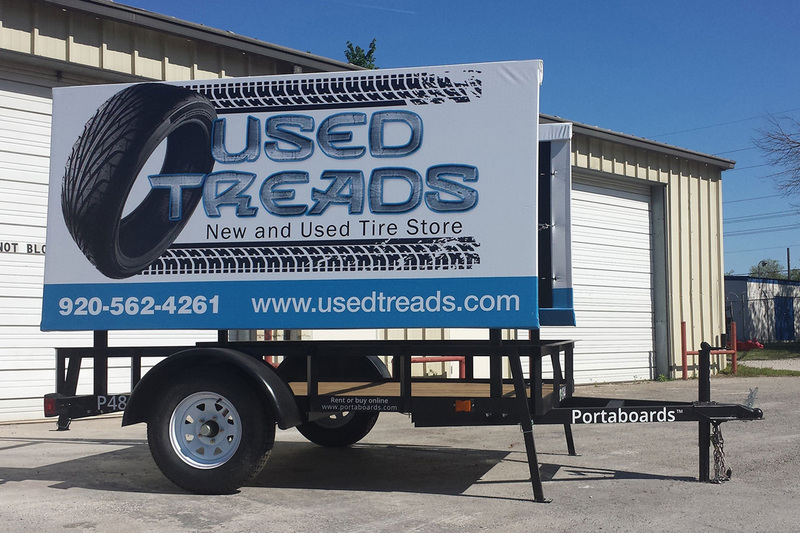 Comes with full 6.5’x22′ utility trailer, with double axles and electric brakes, as well as a breakaway kit. 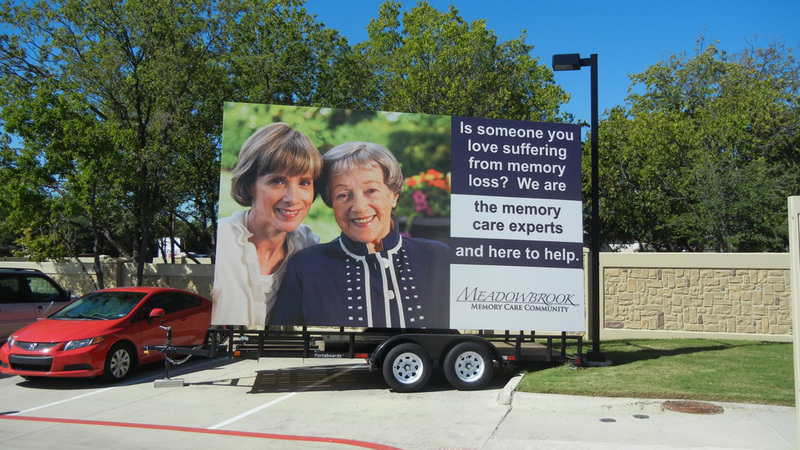 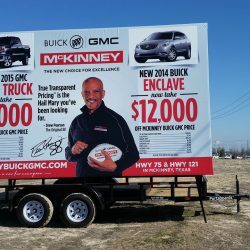 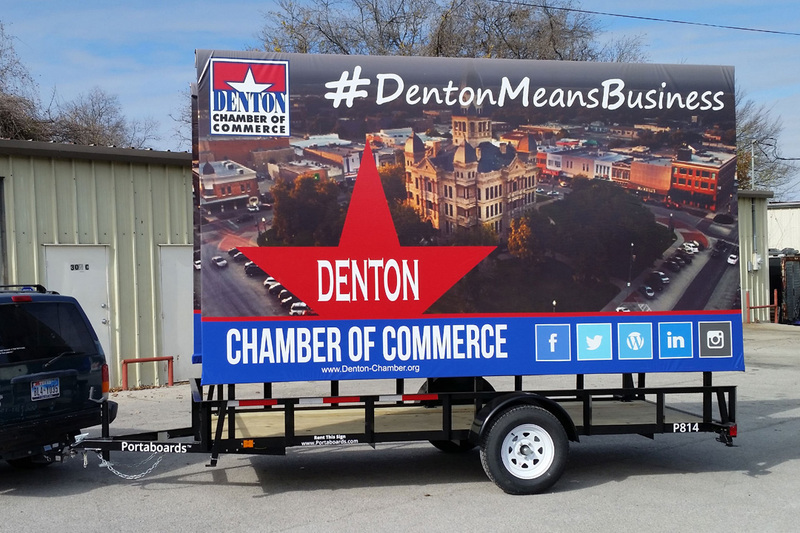 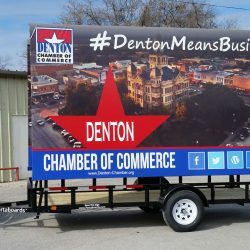 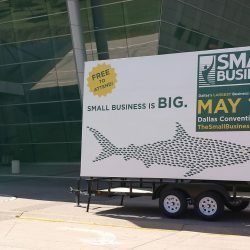 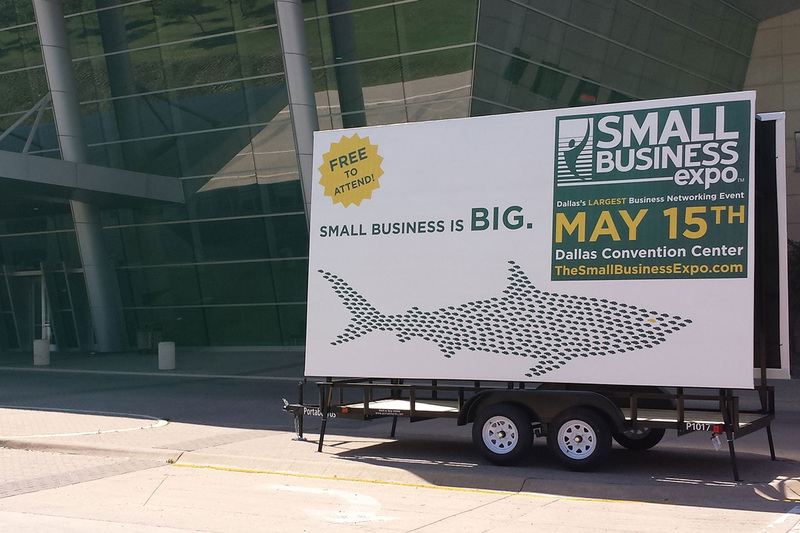 This giant two-sided billboard will help you spread the word about your business effectively!